"Mark and the SoundVision team did an excellent job installing a video wall, in our training room and window shades at our new office. Not only were they easy to do business with, the entire crew was both professional and courteous. If you need Audio/Video services, you can't go wrong with SoundVision!" Smart technology can make meetings more productive and people more efficient. It connects you to your customer and your customer to your brand. Whether making a presentation to stakeholders, entertaining patrons in your restaurant, advertising to passers-by in the mall or displaying public service announcements in your office lobby, we can design a system that makes your business more efficient and sets it apart from your competition. What features do you want – teleconferencing, video conferencing, screen sharing, whiteboarding? What is the desired interface? Minimal interaction, single button press or plug-n-present? Do you want to avoid the use of small, uninstalled units such as a hand-held remote control that may disappear in a huddle room? Will users be mobile – on phones and tablets? And how many connections are needed? Do you want to create a standardized solution that will be replicated company wide? Effective Communication – Are we speaking the same language? In this era of rapidly evolving technologies, new terminology and acronyms abound. UC, VTC, VC and VMR, for example, can mean different things to different people. One person’s definition of video conferencing may mean a traditional conference room set-up with dual screen monitors that display far-side participants as well as shared content, while another may be envisioning a video call in the cloud with a completely remote or mobile staff. Collaboration is another term that requires clarification. To some it means simple screen sharing via Go-to-Meeting or Webex while others imagine a fully interactive experience that allows wireless sharing of multiple PCs. 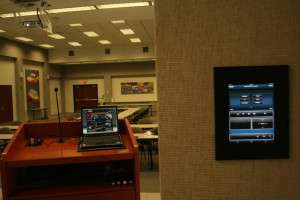 Wireless presentations from a laptop, tablet or mobile phone (BYOD – Bring-Your-Own-Device) can offer seamless, convenient connectivity to the shared display but, due to network security, not all IT departments allow this access. Several solutions are available today offering point-to-point connectivity. Accessing a self-contained Wi-Fi or presentation button, users can present without being on the network. Some companies require heightened security measures, restricting wireless and providing only a secure wired solution. Your communications, conferencing and presentation systems are a strategy, not a trend. Be sure your system is based on your needs and desired outcomes and not a particular manufacturer’s newest solution. It should take into account your potential for future growth and needs and provide that scalability. As you add spaces and staff, it is a clear cost advantage to standardize on a solution that can be replicated throughout the building, across a campus or even across the country. Not only will it save in design and installation costs, but users will be more likely to adopt and use the technology in the room if they are already familiar with it. Employee training costs are significantly lower as well. Scalability needs to meet technology. A well thought out strategy and design will provide IT infrastructure to support growth over the next 5 years. Network and data requirements, multiple VLANs and robust Wi-Fi can be implemented now, along with conduit and pre-wire for future expansion. Your communications, conferencing and presentation systems are a strategy, not a trend. Be sure your system is based on your needs and desired outcomes and not a particular manufacturer’s newest solution. It should take into account your potential for future growth and needs and provide that scalability. As you add spaces and staff, it is a clear cost advantage to standardize on a solution that can be replicated throughout the building, across a campus or even across the country. Not only will it save in design and installation costs, but users will be more likely to adopt and use the technology in the room if they are already familiar with it. Employee training costs are significantly lower as well. Scalability needs to meet technology. A well thought out strategy and design will provide IT infrastructure to support growth over the next 5 years. Network and data requirements, multiple VLANs and robust Wi-Fi can be implemented now, along with conduit and pre-wire for future expansion. The solution drives the best possible outcome. Partner with an AV/IT professional to create huddle spaces, conference and training rooms and board rooms that are efficient, effective and impactful, for your users and for your bottom line.